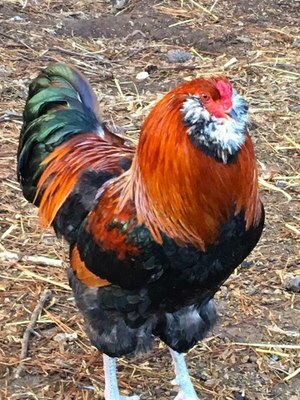 Ameraucanas, known as the "Easter Egg Breed", are a multicolored breed. They have beards, muffs and a normal tail with a tail head. They are often incorrectly called Araucanas, which have ear tuffs, are rumpless, and do not have a tail head which gives them a bunny tail appearance. Most of the chicks sold as Araucanas are really Ameraucanas, which are excellent, efficient producers of large eggs of many colors and shades including blue and green. Standard weights at maturity are males-5 lbs. and hens-4 lbs. The Ameraucana came from blue egg laying chickens, and are closely related to the Araucana, but they have since differed greatly. Instead of ear tufts, they have muffs and a beard. Instead of Araucana temperament, they are docile and sweet. They also have a formidable constitution. They're also more common than Araucanas, although the Ameraucana is still quite rare. They are also very different from Easter Eggers, which lay blue and green eggs but don't conform to any breed characteristics. Ameraucanas are of medium size, about 6 to 7 lbs, and kept primarily for egg laying. Their egg laying ability is considered fair, at 3 blue eggs a week. They aren't especially broody though. The APA recognizes the blue, black, blue wheaten, brown red, silver, wheaten, and white varieties. Also notable is their slate blue coloring in their legs.